Etude, a French word meaning study and usually applied to a musical composition, is the name of an outstanding winery in the Carneros region of California, and I was fortunate enough to visit it this week. 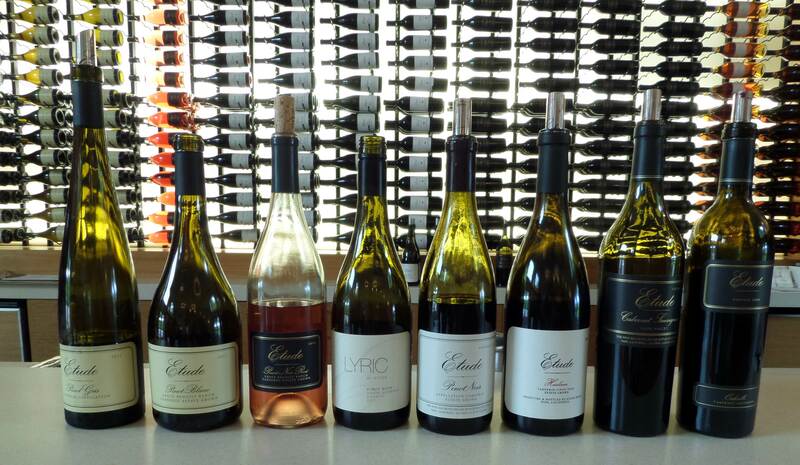 Naming the winery Etude is a reflection of the founder’s philosophy that to make wine requires a lifetime of study. Current winemaker, Jon Priest, has been working with founder Tony Sorter at Etude Wines since 2005. The winery is actually owned by the Treasury Wine Estate group, of which Beringer, Chateau St Jean and Penfolds, to name a few, are also a part. 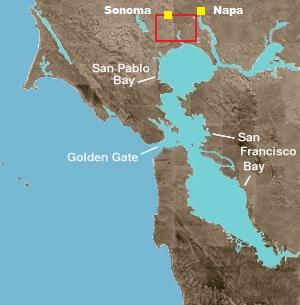 Los Carneros is an American Viticultural Area (AVA) north of San Francisco and is known for Pinot Noir and Chardonnay production as well as sparkling wine (Tattinger, Mumm and Chandon all have wineries in this region). Close enough to experience the cooling effect of the fog coming in via the Petaluma gap from the bay in San Francisco, Carneros is cool enough to provide a suitable climate for these grapes. During our visit to Etude we tasted eight wines with our lovely host Tammy White – a Pinot Gris, Pinot Blanc, Rosé, three Pinot Noir and two Cabernet Sauvignon. The three Pinot Noir we tasted included the excellent value for money Lyric Pinot Noir. Grapes are sourced from Santa Barbara for this brilliantly purple-pink coloured wine. With fruit and savoury aromas followed through on the palate and a light, clean mouthfeel I can definitely imagine this wine being a ‘go to’ wine during the week for a glass or two with dinner. In contrast to the Lyric the 2010’s – the Carneros Estate and Heirloom – had fuller savoury notes with aromas and flavours of forest floor, pencil shavings and spice being more present. The Heirloom is an important wine for the region as it represents clones no longer common in commercial viticulture. Prior to the 1980’s these clones were widely planted before the Chardonnay boom hit California, which saw large number of vines being ripped up and replaced by Chardonnay to cash in on the popularity of the wine at the time. Tony Sorter worked with growers at the time to pay per acre of the vines grown rather than per ton harvested. This went a long way to preserving those older clones of Pinot Noir. In 2000 Tony went back to the growers requesting cuttings from these now uncommon clones and planted the vineyard now producing the Heirloom Pinot Noir. Today there are approximately 10 of these low yielding Pinot Noir varieties in the Estate Vineyard in the far northwest corner of Carneros. Continuing on a heritage theme, another interesting piece of information about Etude’s history is that the current site of the vineyard and cellar door was originally owned by Rémy Martin of famed Cognac production. When the sale completed it was agreed Etude would keep and age a portion of Pinot Noir Brandy (aged 24 yrs) and XO Cognac (aged 28 years). This is limited production and will not be replenished when stocks are sold, so if you are a Cognac drinker be sure to stop by! Cabernet Sauvignon followed the Pinot Noir with two being offered from the Napa Valley. Both wines showed sophisticated integration of oak and tannins and good balance of fruit and acid, so much so that I was very surprised to find these wines were around 14.8% abv. The wines were multi-layered, providing aromas and flavours of blackcurrant and black plum with spicy notes of dried thyme, aniseed, fennel and liquorice and the subtlest hint of vanilla. Of elegant structure, these wines were a pleasure to taste and I’m sure would be an excellent match to a variety of hearty meat dishes. Sadly for me there is limited space in my suitcase as I continue my travels but I definitely recommend a visit should you be in the region and if you are lucky enough to be able to purchase some I am sure you will not be disappointed! On the palate, flavours of pear (fresh and baked), white peach, lemon and melon with hint of grapefruit. Flavours of fresh ripe Barlett pear, lemon, white peach and spice. Aromas of peach, strawberries and cream and subtle confected red fruits. On the palate flavours of peach, strawberries and red cherries. Sweet and savoury aromas including ripe red plums and red cherries, forest floor, raspberry and black pepper. On the palate a medium minus body with flavours of sour cherry, raspberry leaf, red plums, pencil shavings and forest floor. Aromas of red fruit, forest floor and a hint of farmyard. On the palate notes of sour cherry, raspberry leaf, forest, pencil shavings, wet stone and black pepper. Aromas of ripe red cherries, red plums, fresh raspberries, black pepper and some farmyard notes. Flavours of red cherry, raspberries, red plums, forest floor and black pepper. Aromas of blackcurrant, black plum, mint, black pepper, menthol and cigar box. On the palate a medium body with medium plus well integrated tannins, black plum, blackcurrant, mint and dried thyme. Aromas of black plum, cassis, menthol, tobacco and leather. On the palate a medium body, medium plus grippy tannins with flavours of blackcurrant, fennel, aniseed, black liquorice and a subtle note of vanilla. Where can you get these wines? ← Q: How does one make a pheasant cry?